Atlantic City - We see the sun! We left Utsch's marina in the dark at 5:45 am. We wanted to be sure to have clearance under the Cape May bridges and we did. I used my tried and true formula of both bridges having 58 feet of clearance at low tide and then just subtracted whatever the tide was at the time of passage to get the final clearance. In addition to the tide tables, you also have to figure in the actual water level vs the predicted tide. In order words, the water level may be higher than what's predicted by the tide tables. That's usually due to a strong east wind, especially if it's blown for several days. For example, if you pass under the bridges with a 1 ft tide and at the same time, the water level is 1 ft higher than normal, then you have to subtract 2 ft from the 58 ft of clearance at a normal low tide for a total clearance of 56 ft. Since my mast is only 55 ft 3 in high off the water, I can pass under with the above conditions. For more detail, see Water Levels in my blog. Once out in the bay, we were ahead of the change in tides. The current was still flowing out of the bay, and ebb tide. We had to buck current until the flood tide caught up with us. The best strategy for doing that is to stay over to the side of the bay, nowhere near the main channel. The tide always changes first along the edges of a river and that's where you want to be when the tide is changing slowing in your favor. The sailboats following the main channel will see the foul tide the longest and strongest. At first, we were seeing 0.7 kts of foul tide when there was 1.5 kts in the main channel. That can mount up over the course of a 63-mile run. Eventually, the current reversal catches up even in the main channel and it doesn't make any difference after that. 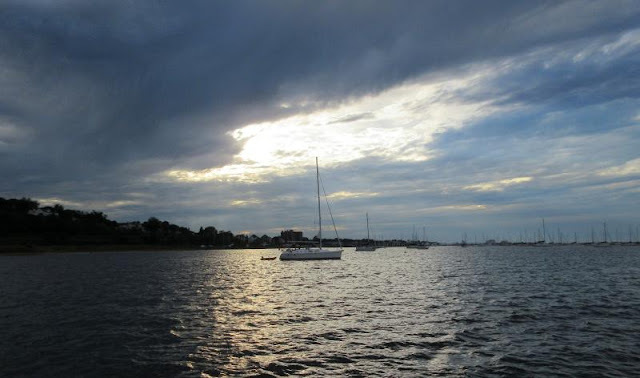 We started out at 5:45 am and dropped anchor in Chesapeake City at 2:15 pm. We average 7.3 kt through the water but the tide helped us a lot at the end. The weather looks very settled over the next week and we intend taking full advantage of that to head south as fast as we can. We have a dock reserved at Downtown Hampton Public Piers for three days where we will provision for the rest of the trip and assess the situation down south by the Socastee Swing Bridge which is presently still closed due to high water - but it's dropping now. Our next destination is Rhode River for Monday. It was a calmer day than we expected and we probably could have moved on but we enjoyed the warm day here. The work on the bridges in the Cape May Canal is completed but the height boards don't agree with each other depending upon which way you go! I'll still with my 58 ft at low tide which has served me well for the last 9 years. I suspect that there's more than 58 feet of clearance at low tide but I'm not going to test it. Remember, you also have to figure in the true water height vs predicted tide height in the calculations of how much clearance you have. The marina here looks to be completely full! Business is booming and that's a good thing for the economy. On the other hand, boats are piling up, waiting for the Socastee Swing Bridge to open for the way to Georgetown to be clear. That's not going to happen for at least another week. Meanwhile, we'll make our day south at our pace, one day at a time. We do hope to make the hop to Chesapeake City on Sunday. It will be along day but the tide will be with us and with light winds. 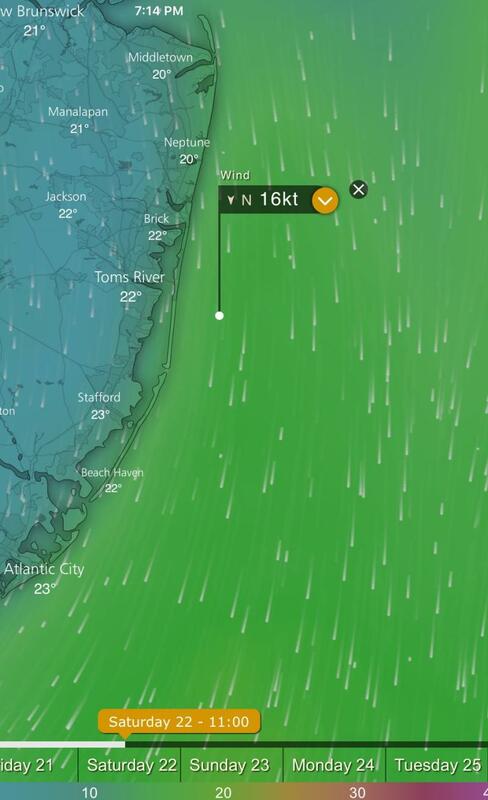 Early in the morning, we saw winds of 28 with gusts to 32 kts at the buoy in the southern part of Delaware Bay. We really didn't want to be out in that so we delayed our departure from Atlantic City until 10:30. The winds were supposed to die down in the afternoon but as with all predictions, the weatherman takes no responsibility when he's wrong! We were met with 4 to 5 ft seas that had us pitching like a rocking horse with water over the bow with regularity. Once again, there was no danger, it was just an uncomfortable ride with the 20 kt winds. Noon came and passed with no relief even though the forecast said the winds would moderate. 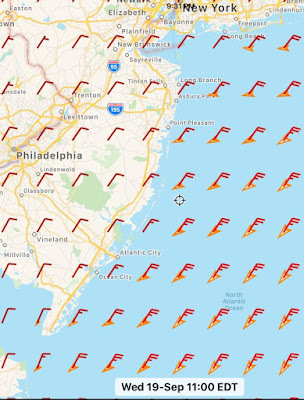 Every single app was wrong as was the Coast Guard forecast (Windy, SwellInfo, PocketGrib, PredictWind, Ventusky, WindfinderPro, and the Coast Guard forecast). As a rule of thumb, just take whatever is forecast and double the wind speed for safe measure. Coming into Cape May, we saw 20 boats anchored by the Coast Guard station. There still seemed to be some room left but it did look crowded. We elected to take a dock at Utsch's Marina, a long time favorite of ours at $2/ft. 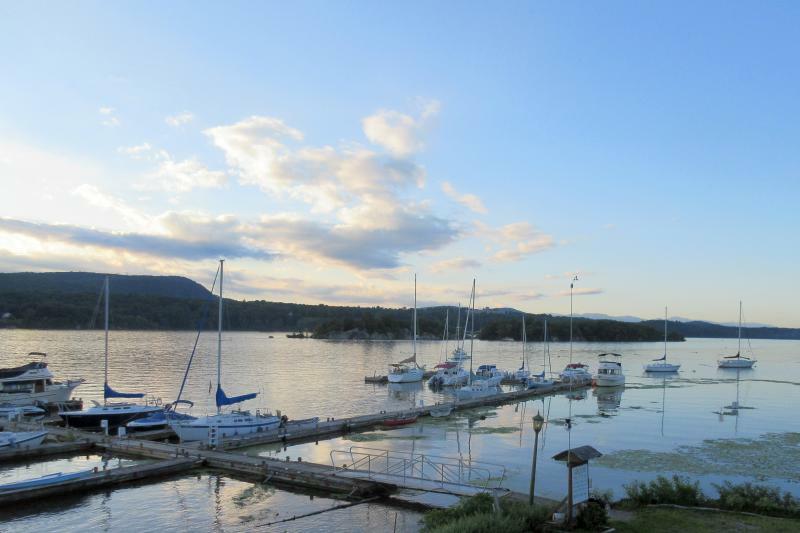 It is not a fancy marina but it does have excellent washers and dryers and good protection with good fuel prices. 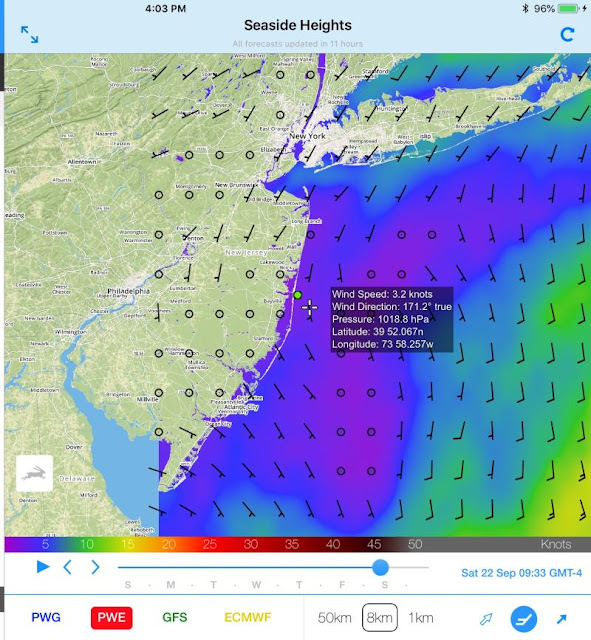 Saturday is predicted to have light winds (5 to 10 kts out of the NW) which would normally be good enough for a trip up the bay but with the luck we've had with forecasts, we will not chance that 5 to 10 turning into 10 to 15 which would be disastrous against a flood tide. With that, we'll wait until Sunday when the winds turn to out of the northeast, a much better direction for going up the bay. They are still in the 5 to 10 range but even if they strengthened, they would not be against the tide. We will wait and see. 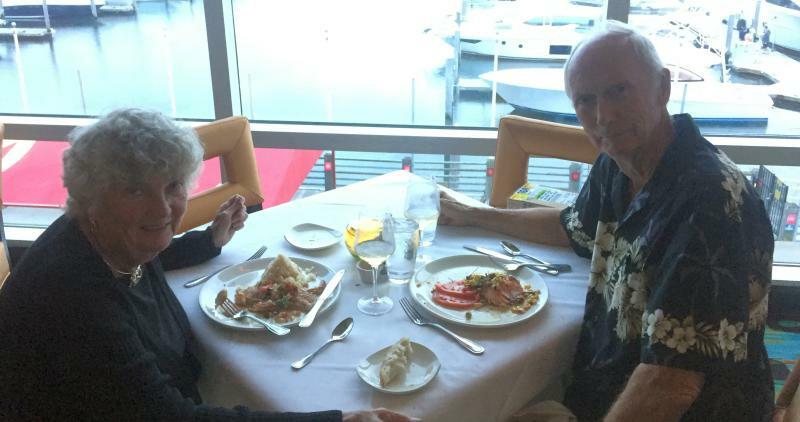 Given that this was our last day, we decided to celebrate with a dinner at the Charthouse. 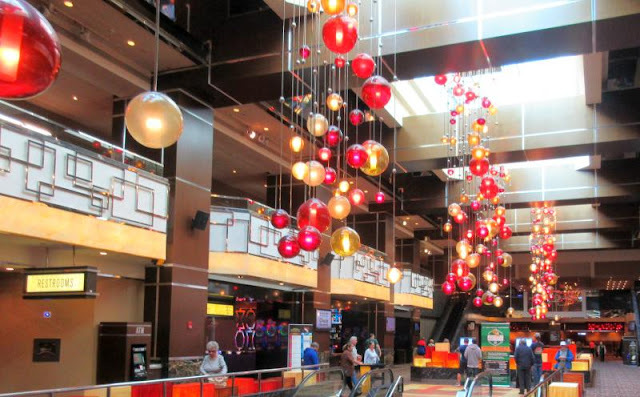 It's a tradition with us when we're in Atlantic City. I made resercations for 5:30 and then discovered that they had a special menu if you ordred befoe 6:00 pm. You got a three course meal for $29.95. Comparing the two menus, the regular vs the $29.95, they both came from the same kitchen and after all the adds, it worked out to about 1/2 price. I had the salmon and Ann had the Mahi-Mahi, both were good along with the clam chowder soup and dessert. With my $25 birthday credit form Landy's Select, it was reasonable. My repair package from McDonnell Marine finally found it's way to me. It was originally sent to Atlantic Highlands but the sender neglected to put my name on the package. The marina there had no idea that it belonged to me! FedEx was fine, they delivered the package to the address indicated. We had to leave the next day for Atlantic City and I called FedEx to see if they could pick the package up and redirect it to me at Atlantic City. They succeeded today! I pcked the package up at 4:30 at the marina officc. I give a lot of credit to FedEx for working through a problem they did not create. There are some things you just have to do on a boat, however much you don't want to. So I spent most of the day getting the heads in order. Having a working engine is vital, you need your sails if you're a sailboat, navigation instruments are essential - but nothing compares to not having working heads! Ugh! We are waiting for our package of parts that were supposed to be delivered to Atlantic Highlands to reach us at Atlantic City. We don't have a tracking number or any other information but the package is due Thursday. Meanwhile, my patch fix is still holding. To add to everything else, my Prosine 3.0 gave up the ghost. It was 15 years old so I suppose I can't complain but I am anyway. The closest match I found that was reasonable was the Xantrex Freedom XC 2000 So I have it on order for pickup at Hampton, VA. We use it for powering the microwave for reheating leftovers for lunch and for our 400-watt Brightown heater that works well for keeping the windshield clear during foggy or rainy days. We had a 200 watt heater but it wasn't enough. Our 1000 watt ceramic heater we use for the main cabin was too much. The 400 watt unit is just right. 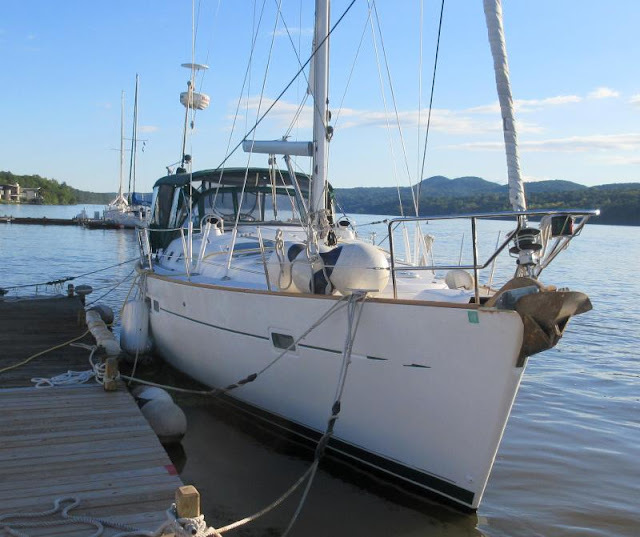 Hopefully, our engine parts will arrive Thurday and then we'll be ready for our trip to Cape Map at Utsch's Marina. If all goes according to plan, we'll leave in the dark Saturday morning to get under the Cape May Canal bridges and out into the bay on the way to Chesapeake City and the anchorage there. It was just dredged so it ought to be good. A day can't be all bad when the sun comes out. It mostly didn't rain either, what more to ask? Well, one thing to ask for is a weather window to reach Cape Map. Thursday would probably be a good enough day but we're going to wait for Friday to leave. After that, one app says Saturday is good for going up Delaware Bay and the other one says Sunday is the day. Things usually become clearer when you get closer to decision time. At least we are situated well for a flood tide going north to Chesapeake City. One thing you never want to do is experience wind against current when transiting Delaware Bay! It can be downright dangerous. The saga of the lost FedEx package was solved today. It turned out that the sender "ran out of room" in the address field given the long marina name to include my name. The marina got a package addressed to them with no indication that it was directed to anyone else. FedEx had delivered it but the marina didn't realize it was directed to me since my name was not on it. I got FedEx to retrieve the package and redirect it to Atlantic City with a due date of Thursday. Let that be a lesson to all, be sure that your name is on a package to be delivered to a marina! 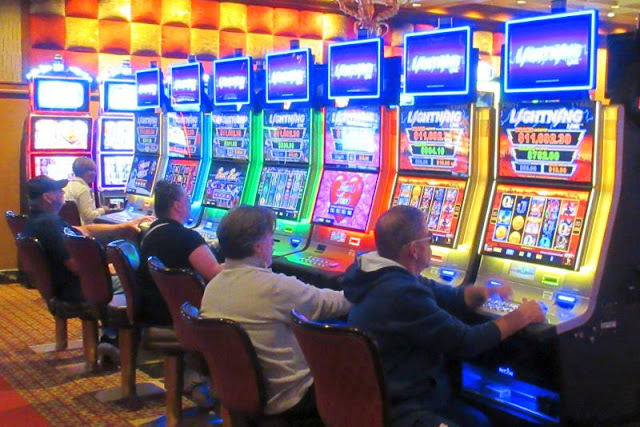 The marina here seems to have fewer empty slips than in the past but in walking through the casino this afternoon, I didn't notice a bigger crowd than usual at the slots. Meanwhile, we're just waiting for weather for the trip to Cape Map. 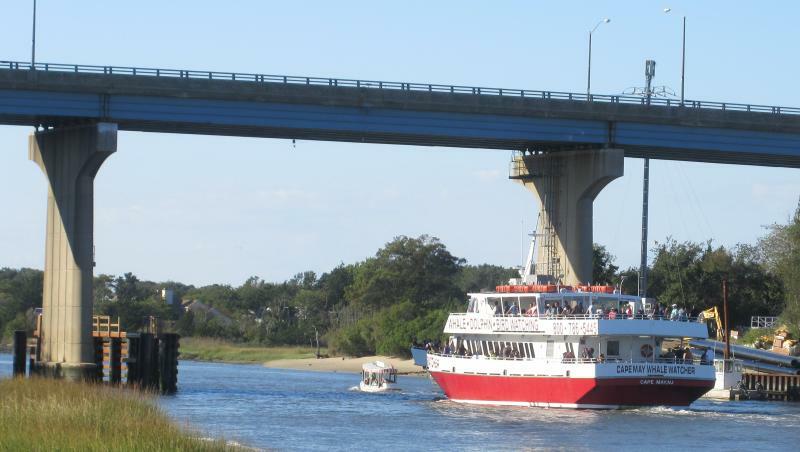 I think everyone is piling up, waiting for the Socastee Swing Bridge to be operational again. It's blocking the entire ICW. Unfortunately, the river there hasn't even crested yet, it's still going up! It zoomed by the old record by 2 ft and still moving. I would guess at another 1.5 weeks until it's open again so we're in no rush. At least the sun came out today for the first time in over a week! The wind is howling, the rain is pelting, and it's cold outside. But we are snuggled up inside with both heaters going, 1500 watts for the main cabin and a 400 watt unit for the forward berth. The combination keeps Fleetwing nice and comfy. Taking Hoolie outside is a test of timing between rain showers but it so much better than taking him ashore if we were at anchor. So what do we do on a rainy, cold, windy day? Ann painted and I like the results. 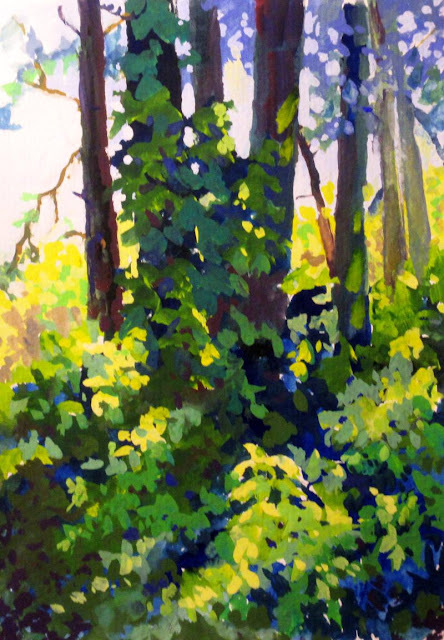 It's a scene from our backyard during warmer days. I worked on tracking down that package that was supposed to be delivered Saturday. 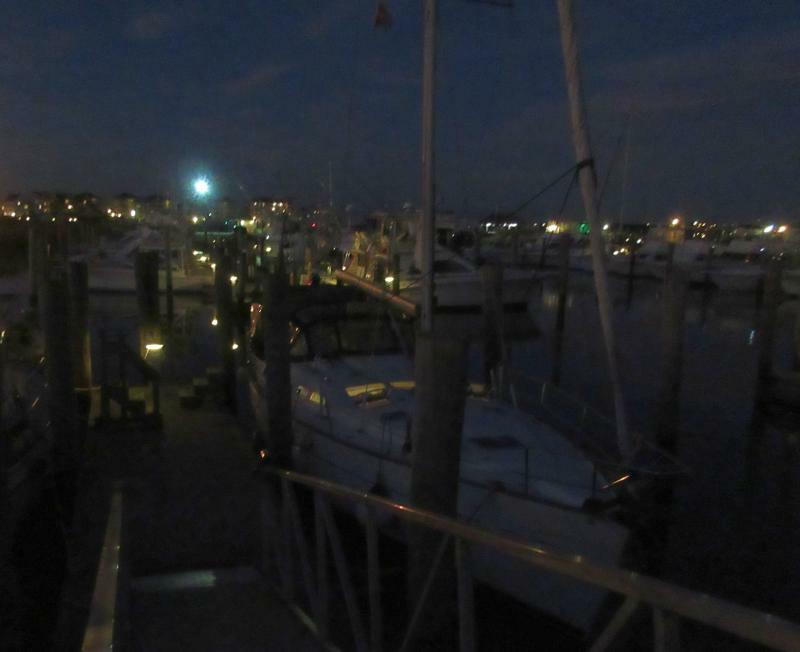 FedEx says it was delivered, the marina said it never was. So now I'm in claim mode with FedEx. The guy that delivered the package was off today so FedEx will ask him where exactly he thought he delivered it when he returns to work on Tuesday. We are pretty much in waiting mode for a weather window and Friday still looks like the earliest calm day. Thursday is doable but for us, Friday is calmer and we like calm. Of course, the forecasts for 3 to 5 days out are always better than when they actually appear on your doorstep. 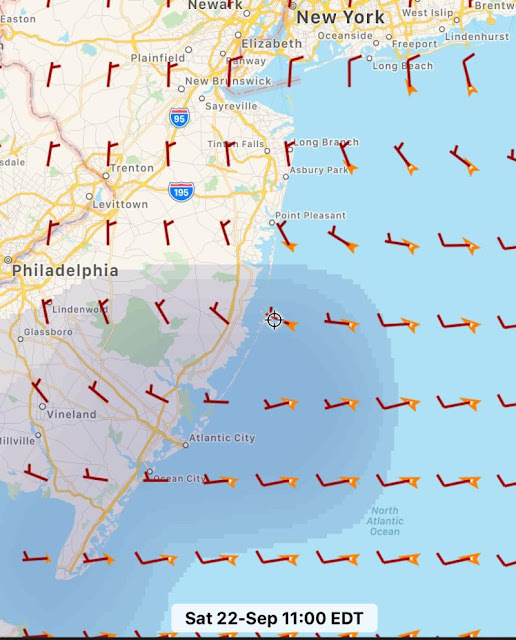 There are a bunch of us holed up along the New Jersey coast from the Atlantic Highlands to Cape May, nobody is moving for a while. The weather window was closing up fast. 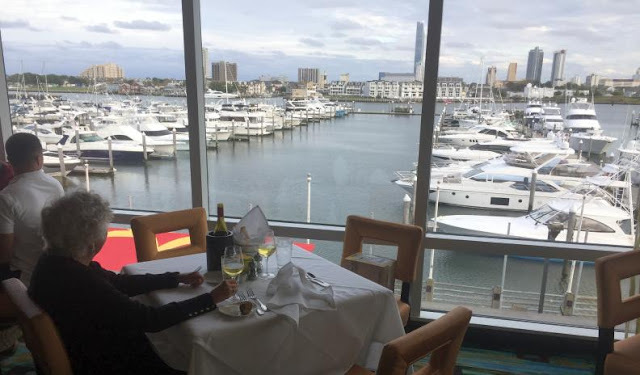 It was either Sunday down the New Jersey coast or wait for three or four more days in Atlantic Highlands at anchor. 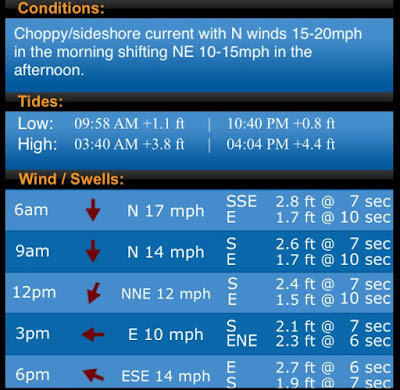 The forecast wasn't that bad with winds out of the northeast 5 to 10 in the morning, increasing to 10 to 15 in the afternoon with 2 ft swells. I had ordered a part overnight for the fuel leak but it didn't happen. I hate to think what I paid for that service. So I did a boater's patch and all was fine for the 10.5 hour trip down the coast. I'll have to make a permanent repair while in Atlantic City. We left at 6:00 am in the dark and headed around the tip of Sandy Hook. We faced a foul tide heading out for over an hour but it gradually dissipated and we made very bouncy progress southward. 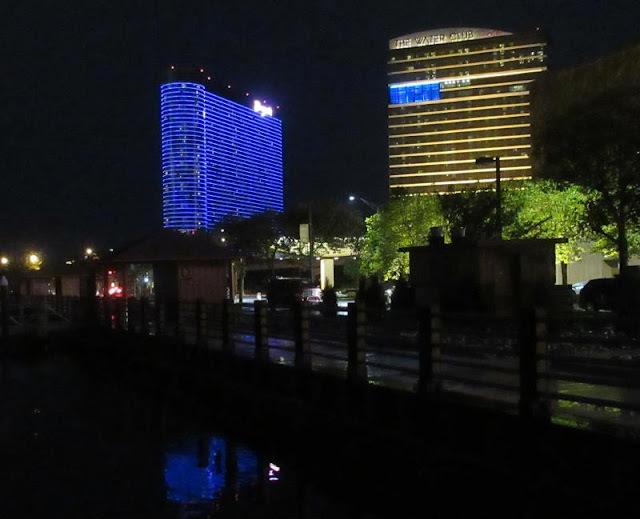 Just to add to the complete experience, rain started in and didn't stop until 8:00 pm that night in Atlantic City. It was a miserable ride. It wasn't unsafe or dangerous, just not comfortable. 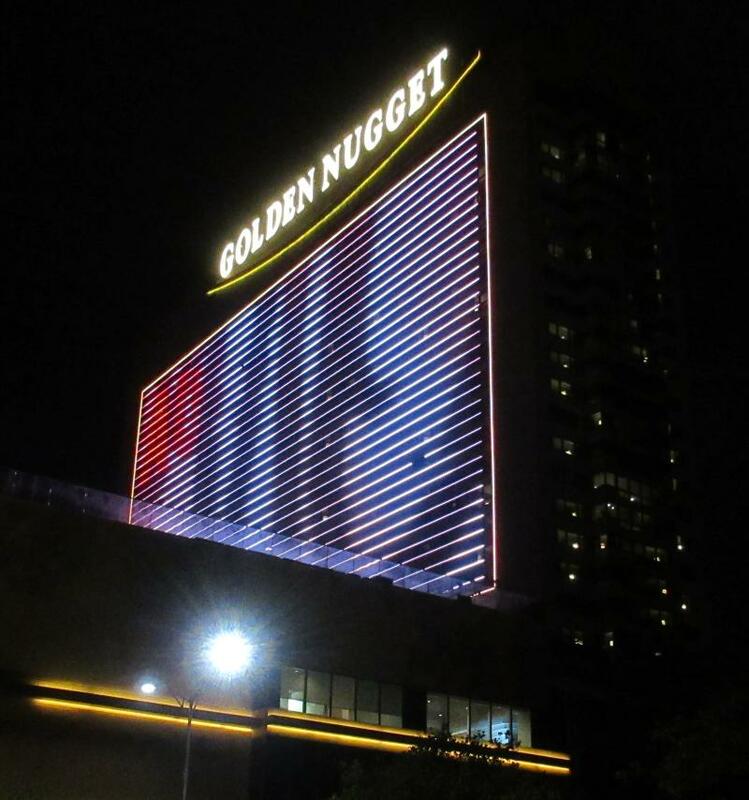 The casinos do believe in bright lights! 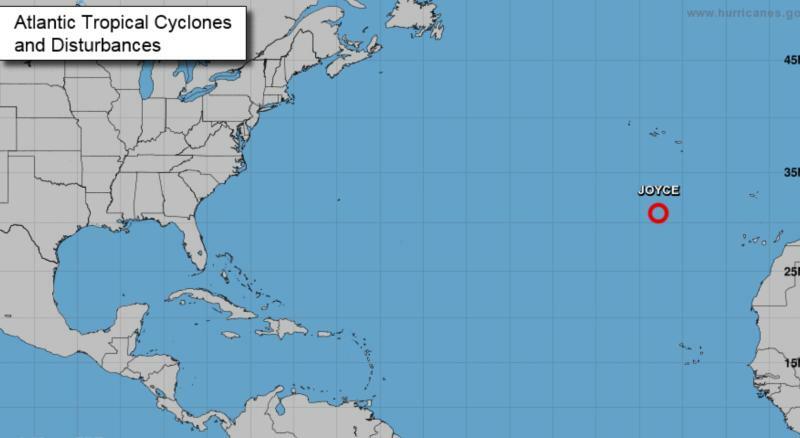 At least now we have the biggest leg of the Atlantic coast behind us. We will just wait for a perfect day to reach Cape May, however long that takes. We don't particularly enjoy this part of our trip south each year. It's basically point A to point B. We don't explore the surrounding area. 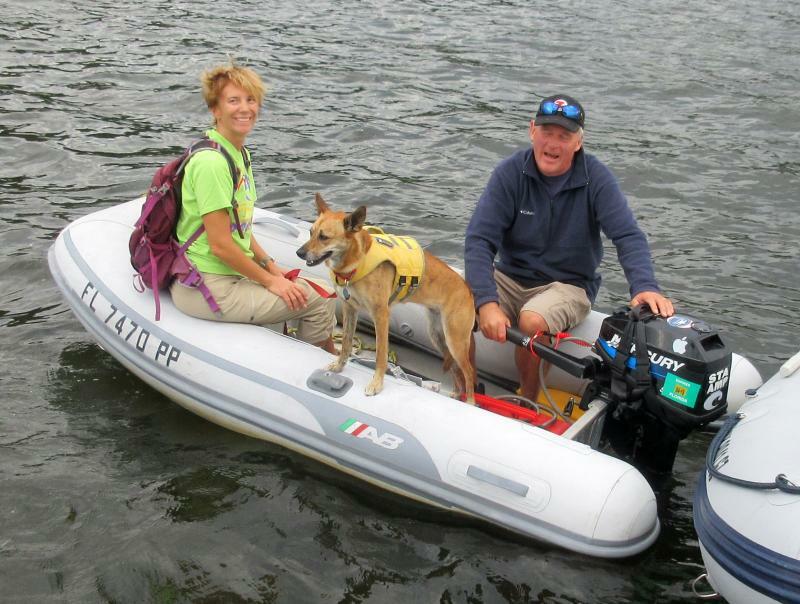 We do enjoy the ICW and the folks we meet along the way. With rain in the forecast for the next several days, we'll be here for a while. Sad to say that the part I needed to stop the fuel leak did not arrive today even with overnight shipping. So it was on to stopgap measures. The leak was only at the nut used to bleed the fuel line so it wasn't all that critical, I just needed to stop the leak at that point. The O-ring fix I applied yesterday seemed to hold so I'll go with that to Atlantic City. If worse comes to worse, I'll put a clamp on the top of the nut to squeeze it down int he same way that screwing it in does, pressure to the O-ring. Aside from that, the Prosine decided not to work anymore. It's 15 years old so it's not worth repairing, just get a replacement. The risk of something like that always seems to be higher after a pause in cruising. Leave something unused for a while and decay sets in. The cure is simple, don't stop cruising! We cruise 9 months of the year but I suppose we need to cruise all 12 months to keep everything working, including us! Dawn and Paul Gudelis came by to visit this afternoon. 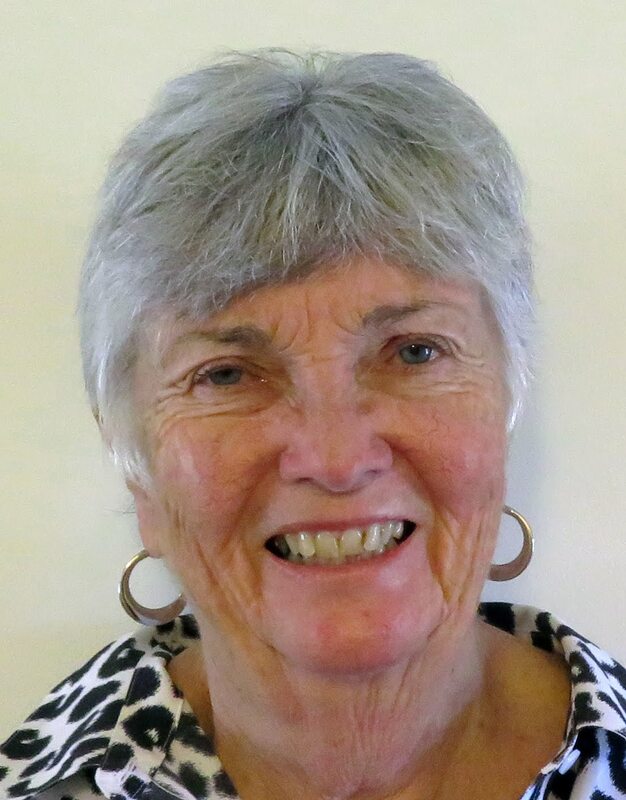 We hope to meet up with them in St Augustine. They also have a boat dog and Hoolie was very interested in the subject. We plan on leaving at our usual 6:00 am and expect the trip to take anywhere from 10.5 to 11.0 hours depending on current. 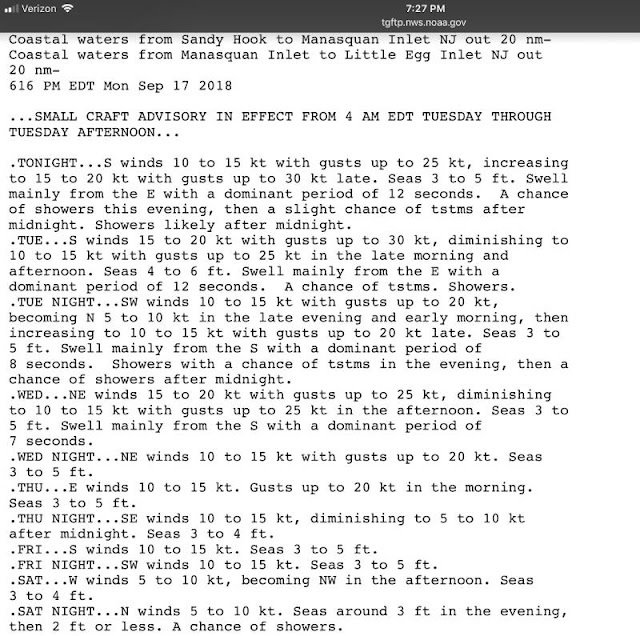 The weather is predicted to be ok, not the best but the weather window closes up tight after Sunday for at least three and maybe four days, then it's on to Cape May. We awoke to an announcement that the Tappen Zee bridge just south of us was closed to marine traffic! That's rather startling to hear when you're trying to head south on the river. If listened closely after the announcement that the river was closed, you heard that you could pass under the bridge using the west side of the channel. One wonders why the Coast Guard couldn't just say that the first time? We passed on the west side with no problem. We got the tip from a tug heading north, we couldn't understand the Coast Guard, very garbled. traffic when going through NY Harbor! After passing that hurdle in our path, we went below to do a routine check on the engine. I found a fuel leak! It was dribbling into the sump under the engine (which is separated from the main boat sump). I had replaced the secondary fuel filter (the one on the engine) as part of getting ready to go south for another year. It was a bleeding tap on top of the filter that has to be loosened to let air out of the fuel lines. Well, it was leaking under the nut. No problem, thought I, just tightened the nut. After I tightening, it still leaked a little. So I tightened it some more. Still a little, More tightening and then it started to leak a lot! With further turns, it didn't seem to help. We then anchored the boat just north of the George Washington bridge to troubleshoot. Upon inspection, I found I had stripped the threads in the female part of the connection. The fuel system was otherwise fine, I just had to find a way to stop fuel leaking out of the bleeding nut. I found a selection of O Rings and fit one the nut that would tighten. However, it was tight enough for the O Ring to seal so we restarted our trip to Atlantic Highlands. 20 boats anchored here tonight! Everyone is backed up. Meanwhile, I ordered the parts I needed and had them shipped overnight to the municipal dock for a Saturday delivery. If all goes according to plan (ha! 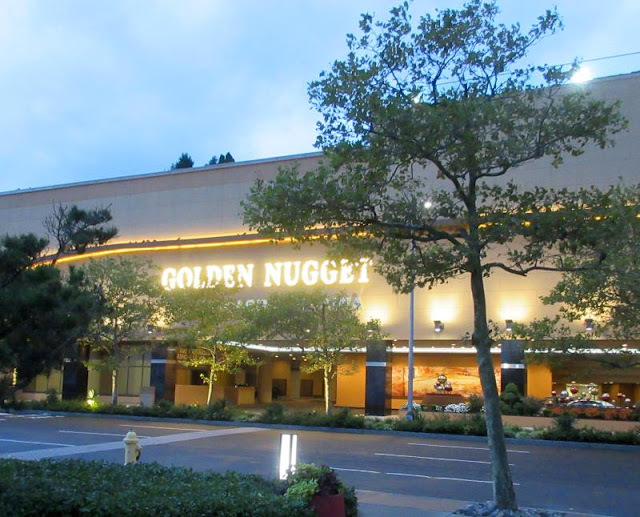 ), we'll go down the coast on Sunday to Atlantic City. Wish us luck, we could use it. The trip down the Hudson was delightful. We had an ebb tide so we were making 8.5 kts near the end of the run. 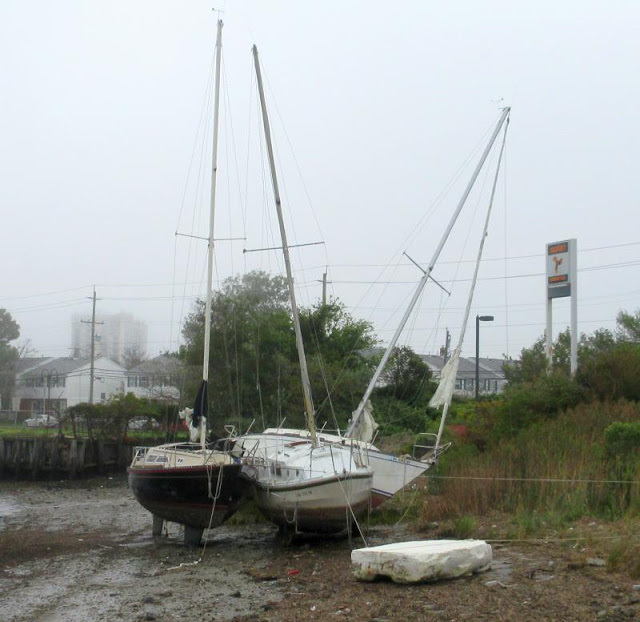 I had sold my previous dinghy to Jack Mace who happened to be a member of this yacht club. He invited us for a night's stay as his guest so we took him up on the offer. It's very nice with a large clubhouse and even a swimming pool although it's closed this time of the year. They just installed a new set of docks that aren't even on the satellite photos. They are very heavy concrete docks that dampen the waves rolling in from passing boats. It seemed to help. The Bear Mountain bridge held the title of the longest suspension bridge in the world for 18 months! On the way down, we heard a call on the VHF that the Tappen Zee was closed to marine traffic! Well, that was a wake-up call. It seems they are still in the process of removing the old bridge and they periodically close the river. You have to request a passage from the Coast Guard and you'll eventually get through. At least, that was working today, we'll find out Friday for sure. 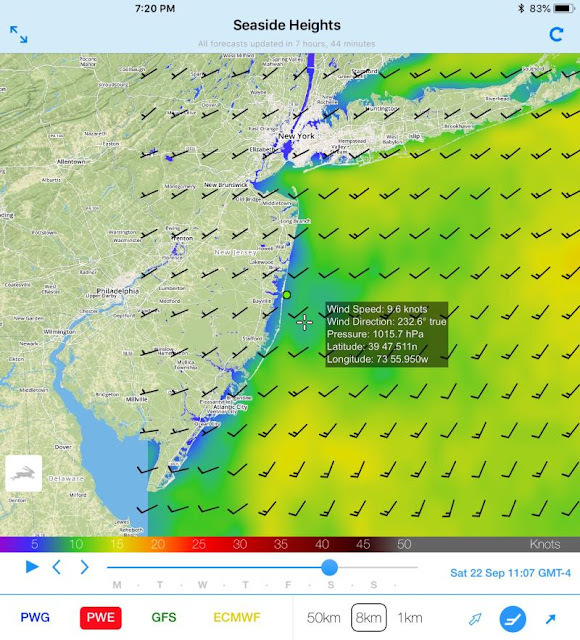 We will leave early Friday to reach the Atlantic Highlands in the afternoon. The Atlantic seems to be settling down and we intend to take advantage of it for a quick trip down the coast. I refuse to look at weather forecasts until Friday afternoon, we're committed anyway. What the weather Gods allow, we'll take, what else to do? Fleetwing sunk another few inches after we loaded the last of our supplies aboard. We planned to have enough supplies to last until we reach Hampton. 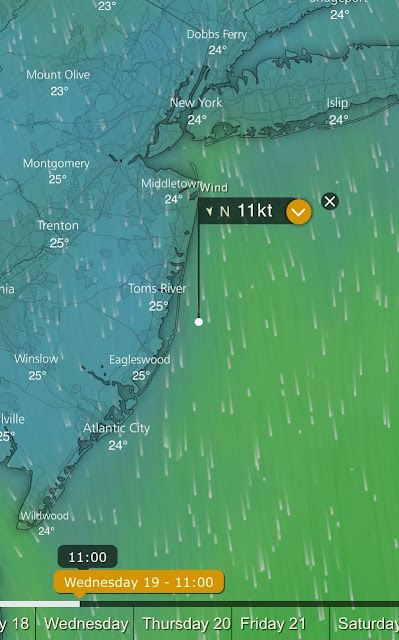 I took one last look at weather apps and then swore them off until Friday night when we reach Atlantic Highlands, our staging area for Atlantic City. They are just crazy. A boat ahead of us kept in communication with us as they went down the coast today. They had a forecast of 10 kts or so out of the north. 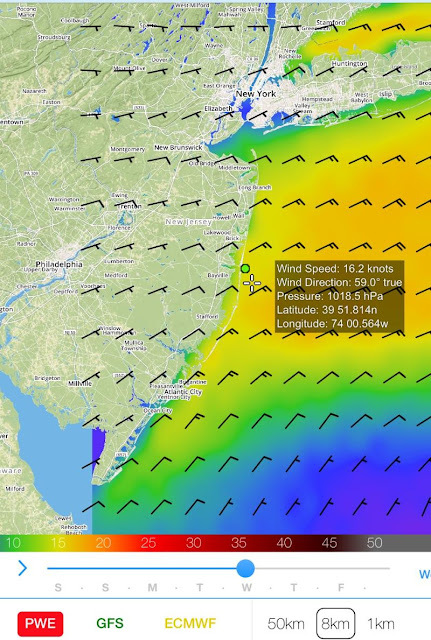 That contrasted with 20 kts out of the same direction from PredictWind. 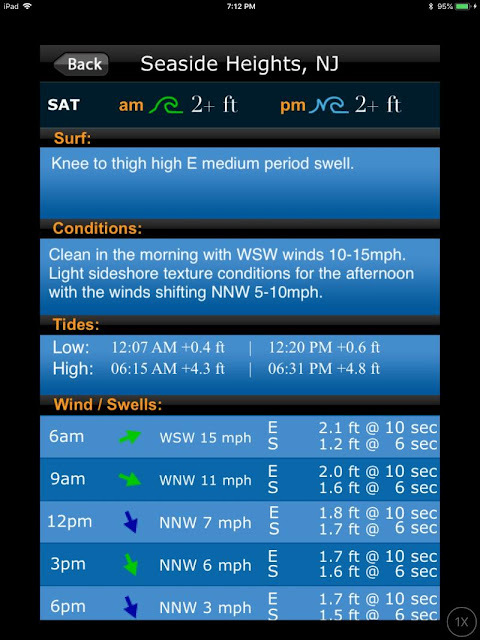 The 10 kt forecast from PocketGrib was right as was the same prediction from SwellInfo. For trips down the coast, I'm going to place more faith in the latter two. 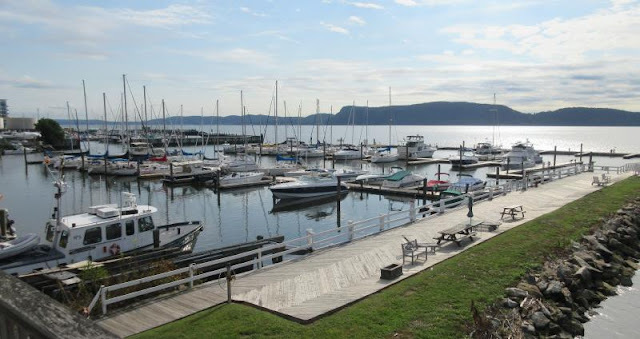 We will leave Thursday morning for Haverstraw Bay to overnight and move on the next morning. When we were getting ready to leave the house this morning, Hoolie was glued to one or the other of us. If we walked towards the front door, he placed himself between us and the door. If we changed direction towards the door to the garage, he scampered right over between us and that door. Likewise, if we headed towards the back door. There was no way we were getting out of that house without Hoolie. He's sound asleep in his bunk now. 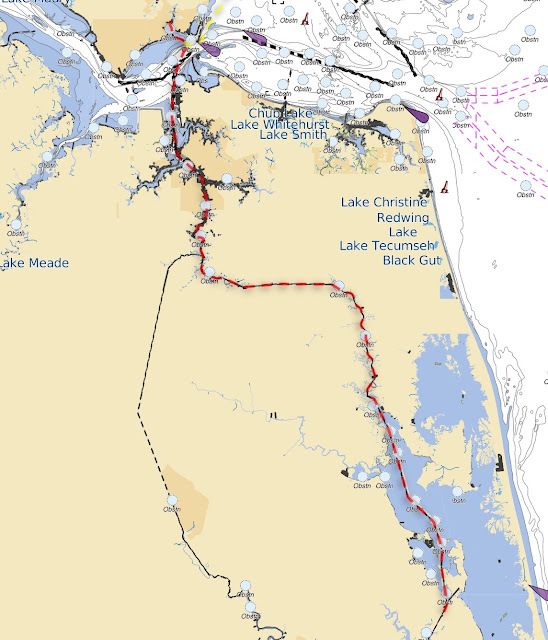 Tomorrow our 9th adventure down the ICW starts. No more weather apps until Friday night! 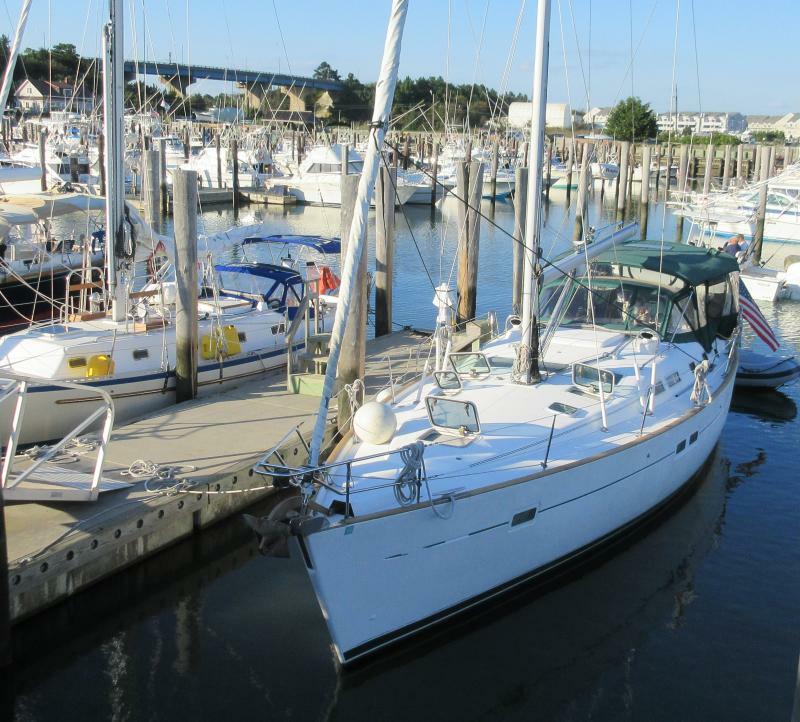 PYC - On to our boat on Wednesday, down the coast Saturday? 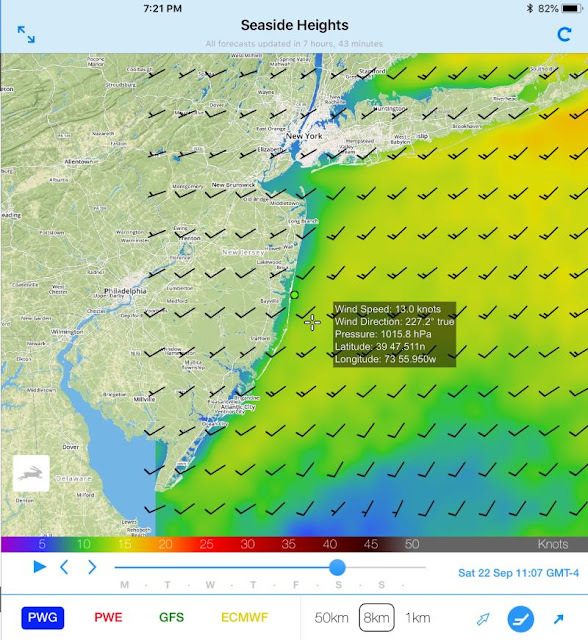 Saturday is still looking like a possible window for going down the New Jersey coast although all the weather apps still contradict each other. SwellInfo is shown above. With that, we'll go on Fleetwing tomorrow afternoon so we can leave Thursday morning for Haverstraw. That will stage us for a trip down the Hudson River to anchor out at Atlantic Highlands on Friday. I expect a crowd since we've all been waiting for the same weather window. Hopefully, there will be room to anchor somewhere. The weather for the trip down the Hudson is supposed to be nice, at least. We have a ton of stuff to do before leaving the house for a couple of months and that will take up most of the morning. Then it's off to PYC and onto Fleetwing for the night. It seems that every year there's something different to worry us about for the trip south. I do have to say that the Atlantic has calmed down for the last couple of weeks. Everybody needs the time to recover from Florence. Now, if only we can find a window down the coast, then we can start to make progress and relax. Looks pretty good does it? Nice ride down the coast with light winds out of the north. Would you rather have more of a push southward with stronger north winds? We can do that too! 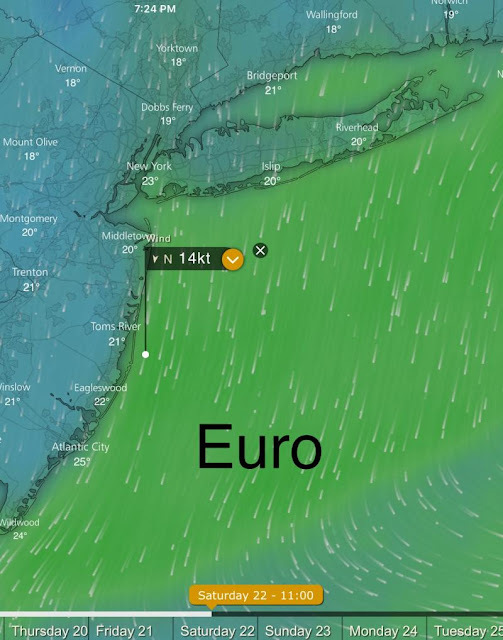 Just look at the Euro forecast from Windy. Well, not as nice but kinda okay. Would you rather have some wind in your face to cool the temperature, no problem. Look at the PredictWind tweak on the Euro model. Perhaps that's not enough wind to cool your face, how about a little more? Here's the PredictWind tweak on the GFS model. No surprise here since it's based on the GFS (US) model without any tweaks. Lastly, let's look at the NOAA coastal forecast. 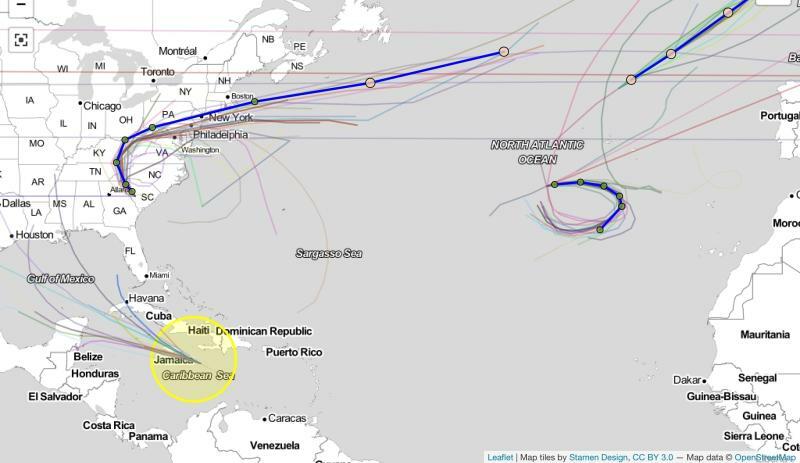 It's based on the GFS model so it follows the forecasts based on that model. So take your pick, light winds out of the north, a little heavier winds out of the north, light winds out of the southwest, or heavier winds out of the southwest. All bases are covered! Something is going to be right. It reminds me of the stock trader that claims to have predicted every downturn in the market - which sounds impressive until you learn that he predicted a downturn on every single day! Can't miss with that strategy. No matter what happens Saturday, one forecast or the other has it right! Regardless, we're leaving PYC on Thursday to make Atlantic Highlands on Friday. We are hoping that our version of the forecast (light north winds) turns out to be the one the Gods favor. Let's roll the dice and find out! 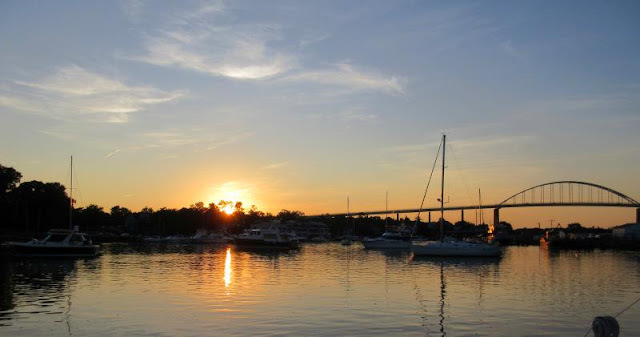 I started a Facebook page that has become the go-to place for the latest ICW status on marinas and general ICW conditions. It's called, ICW Cruising Guide by Bob423. 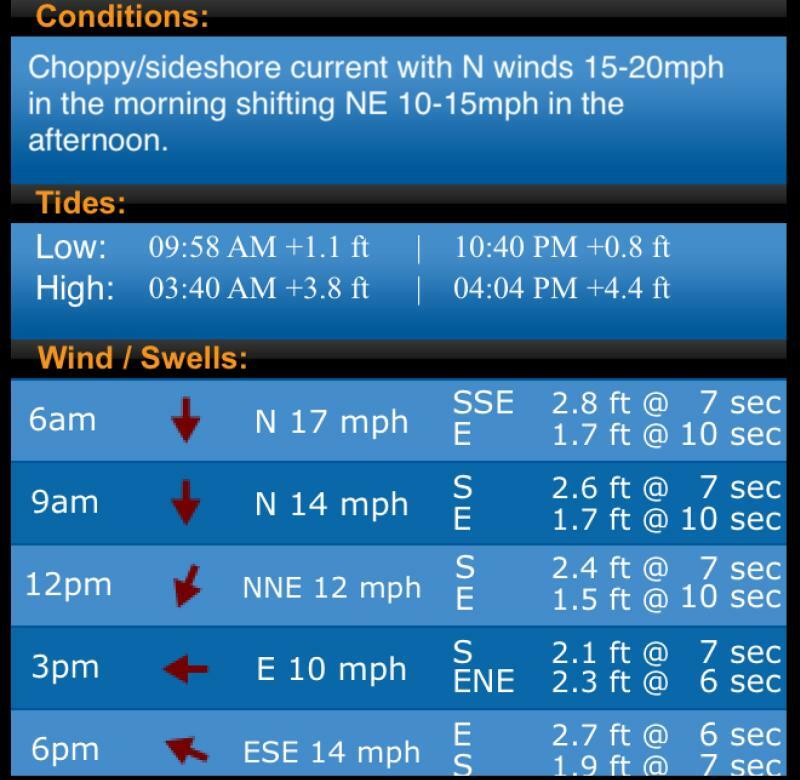 If you want to keep abreast of the latest conditions of the ICW after Hurricane Florence, it's the place to be. Meanwhile, the remnants of Florence will pass over us on Tuesday with rain so we will hang around until an opening appears for a shoot down the New Jersey coast. That opening appears now to be Saturday. 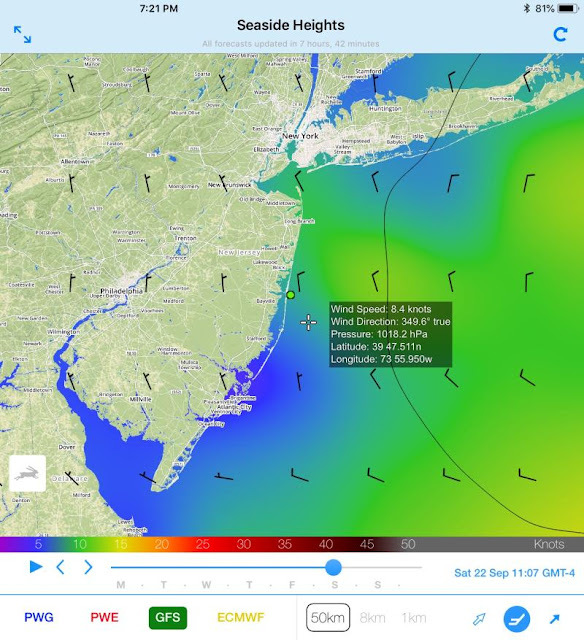 If that holds through multiple forecast revisions (unlikely but possible), then we'll leave PYC on Thursday, overnight in Haverstraw Bay, reach Atlantic Highlands by Friday and then weigh anchor at 6:00 am Saturday morning for the trip to Atlantic City. Wish us luck. The only trouble with these predictions is that when it's that far out, they seem to default to "time of the year" type projections. I'm sure it will change and we will adjust. 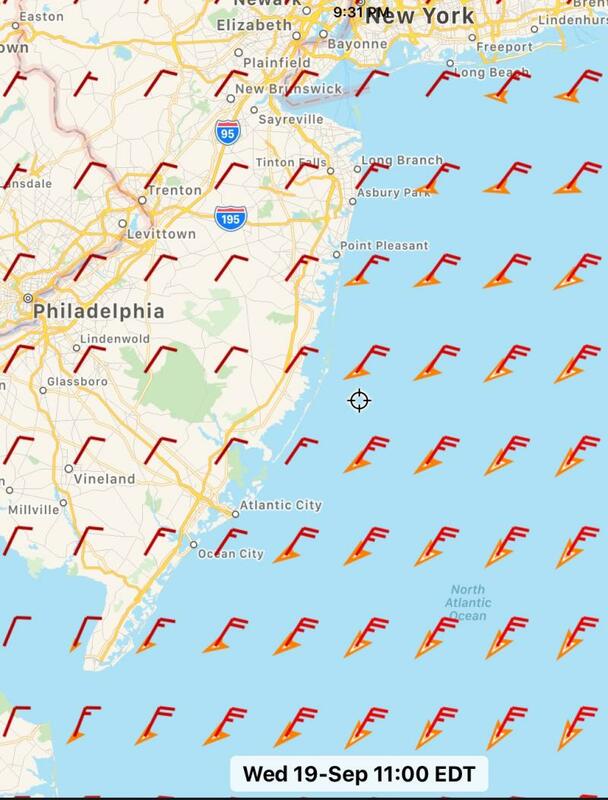 The Atlantic seems to be calming down. Nothing has come off the African coast for a while and we all hope it stays that way! Once Florence clears out, we're out of here! 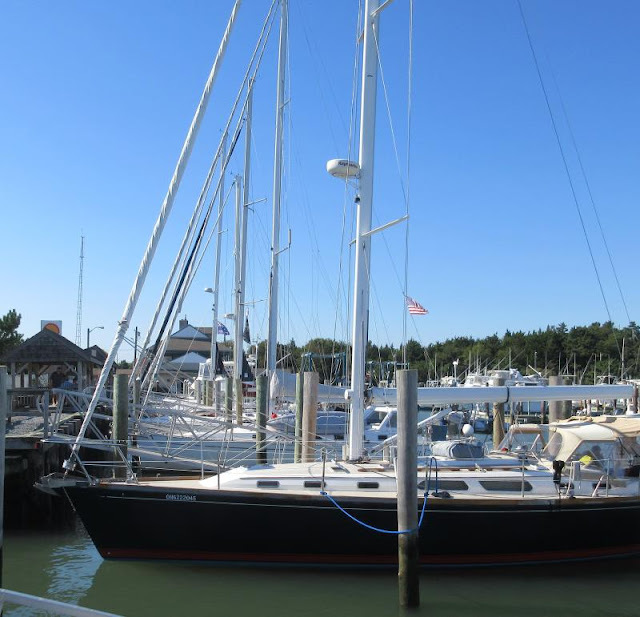 Welcome back to the sailing adventures of Fleetwing as we head south to Key West for the winter. Unfortunately, we haven't left yet. The weather is just not cooperating, especially the remnants of Florence which will pass directly over the Poughkeepsie YC on its way out to sea and eventually Ireland (have you ever wondered how Ireland gets the equivalent of a rainforest's worth of rain every year?) We have the boat packed and ready to go. 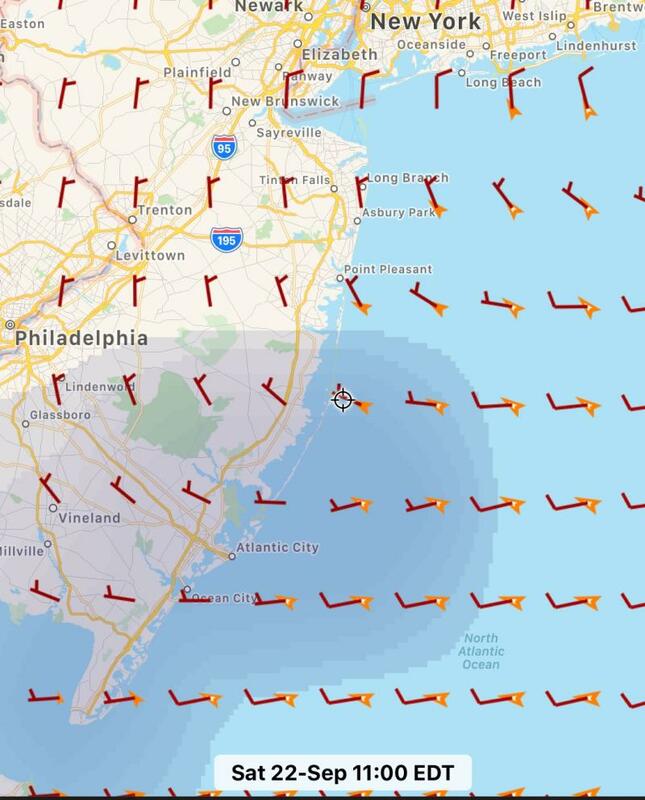 There appeared to be a window on Wednesday for a passage down the New Jersey coast but the various weather apps and Coast Guard are all over the place. 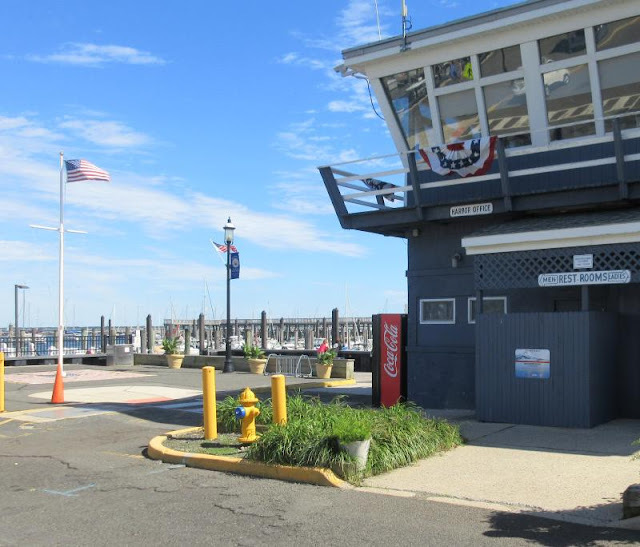 For us to reach our starting point at Atlantic Highlands would involve us transiting New York Harbor in a downpour, not something I want to do. It's due to rain all day Tuesday on the Hudson River. We'll enjoy the view at PYC for a while. Given all that, we'll take a pass on starting out Monday morning (it's a two day trip to the Atlantic Highlands for us) and look for better weather later on. For entertainment, just look at some of the weather predictions. PocketGrib has been my old standby until it was unseated by PredictWind but I still use it occasionally. 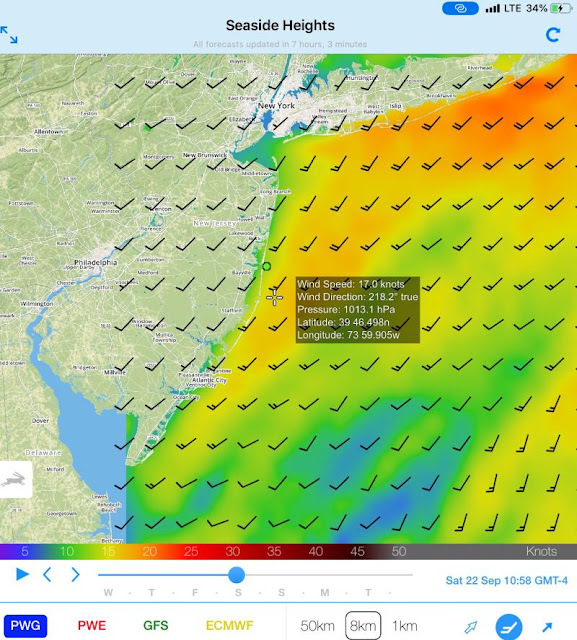 What's not shown here is the southern swell from Florence with the 20 kt winds out of the northeast. Here's PredictWind, not too bad using their twist on the Euro model. Windy is the most benign of all, only 11 kts? I've always used SwellInfo in the past. Looks more windy in the morning but you're going into a 2.8 to 2.4 ft southern swell which is not too bad with the 7 sec period. 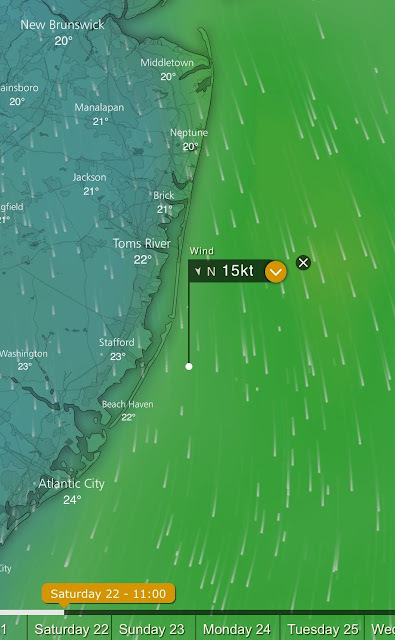 So the wind will be either 20 kts, or 15 kts, or 11 kts - take your pick. Our real problem is getting down to our launching point at the Atlantic Highlands and braving rain on Tuesday down the Hudson and through NY Harbor so we'll wait it out. It does look like the weather appears a little unstable. If I ever get going south, there will be a new feature available for members of this blog page. 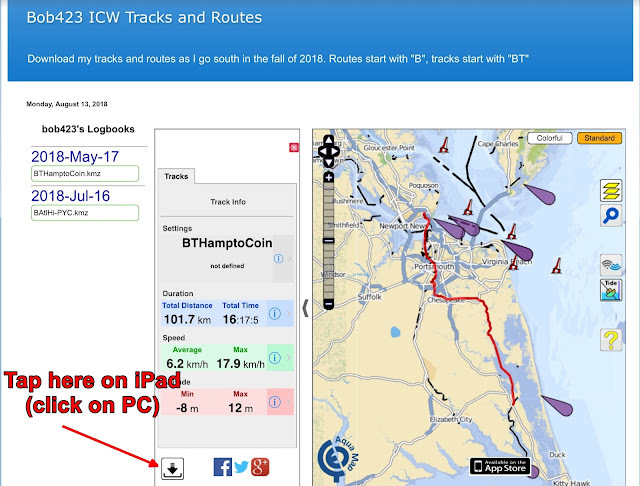 Aqua Map has written a new interface where I will post my day's track and route and the site has a download button for loading them into your app or PC. 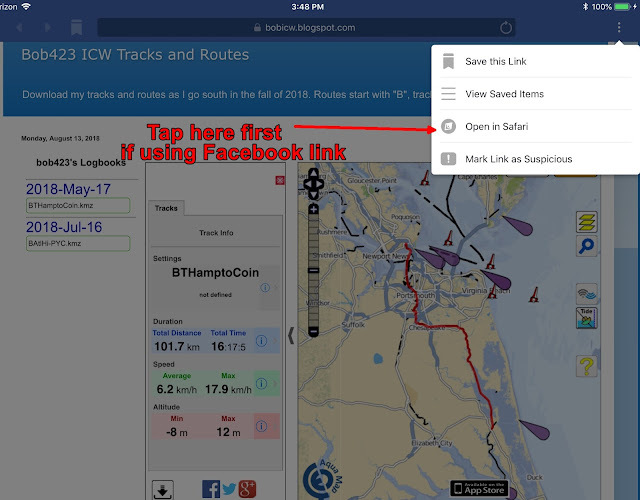 If you have Aqua Map and an iPad, you can open the webpage with Safari and it will place the track or route (your choice) directly into Aqua Map, ready for navigation. I will load my daily track and route each evening into the webpage. You can then follow along the exact path I took for the depths I report on this Facebook page each day. 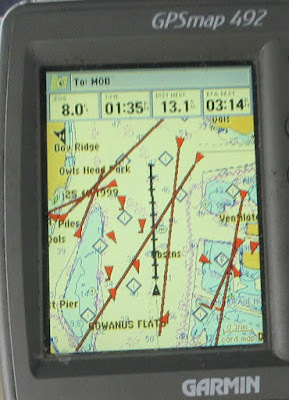 The track will be a dotted red line overlayed on the Aqua Map chart, suitable for navigation. The route is what I had planned to do the previous day - the track is what I actually did. With the route, you can use the ETA to each waypoint function in Aqua Map to time bridge openings. With all the disruptions to be expected from Florence, I can be the guinea pig for those following behind me. It ought to be fun. and choose "Open in Safari". Other browsers may not work. If you clicked on the link in Facebook, you have to "Open in Safari" next. Look at the upper, right corner. There are three dots there. 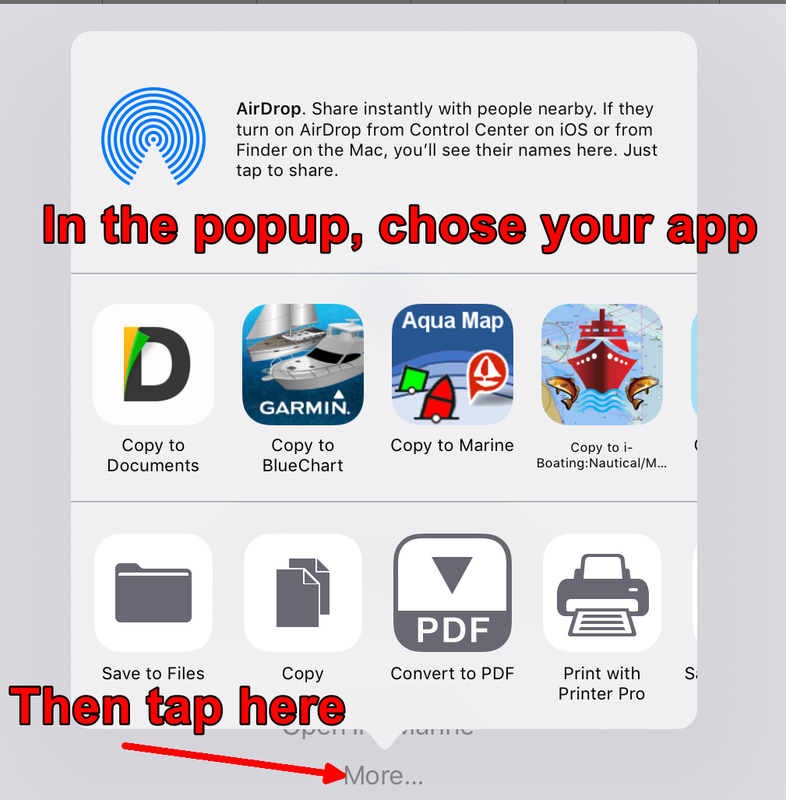 Click on the dots and an option will appear to "Open in Safari". 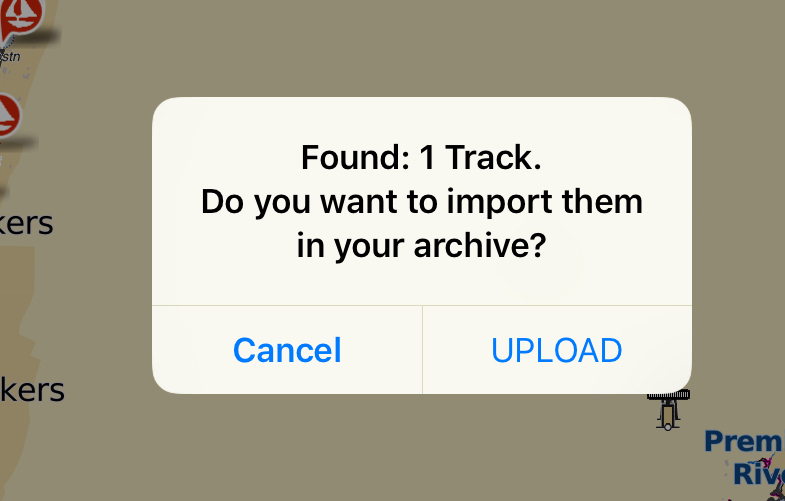 Click (or tap) on that option and then proceed. You will see my most recent tracks and route at the left. Select one or the other and it will appear on the chart above. 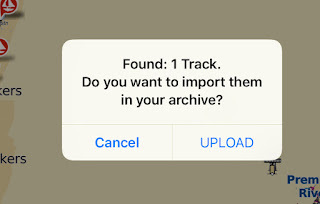 At the bottom of the display, you will see a download button. Be sure you're in Safari, other browsers may have a problem. On a PC, Chrome works fine. 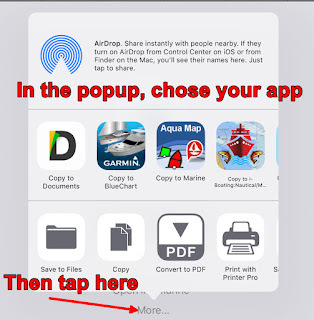 Click on the download button and select the app you want to use. If you chose Aqua Map, then the route or track will appear in Aqua Map, ready for navigation. If you're using a PC, just save the download (usually that's automatic by default to "Downloads") and then load it into your PC navigation program. I've tested it with the Chrome browser. BAtlHi-PYC.kmz is the route I took from Atlantic Highlands to PYC in May of 2018. If you have any problems, let me know. There are further improvements coming to the download site but this is a start.